The Fauré Quartett is a Germany-based piano quartet named for the French composer Gabriel Faure?. 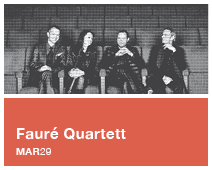 Recognized as one of the leading piano quartets in Europe today, the Fauré Quartett was founded in 1995 by the same four musicians – Erika Geldsetzer (violin), Sascha Froembling (viola), Konstantin Heidrich (cello), and Dirk Mommertz (piano) – who form the quartet today. It should come as no surprise, then, that Fauré Quartett performances are known for their breathtaking balance, ensemble, intonation and finely synchronized interpretation.